It goes without saying, winning against a good team in a hostile crowd on the road, it's just an absolutely huge win. Peyton Manning Quotes. 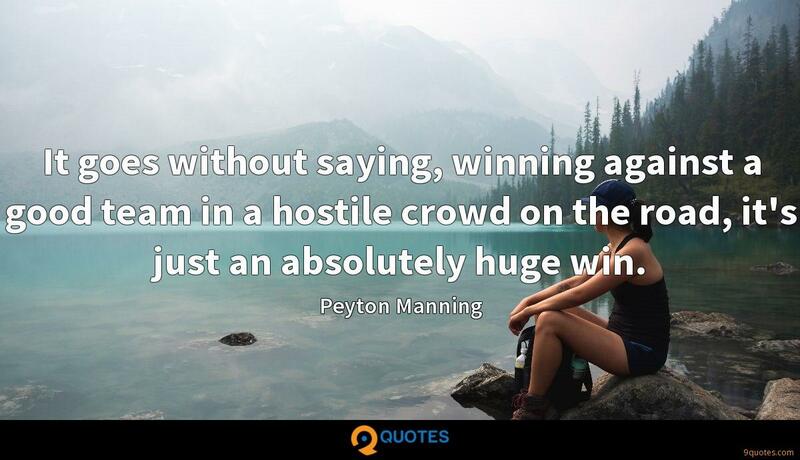 9quotes.com, 2018. http://www.9quotes.com/quote/peyton-manning-187160, accessed 22 April, 2019. As I have always said, the ACA is not without flaws, and I welcome the opportunity to improve the law to make healthcare more affordable and ensure every American has quality health insurance. So, my happiness doesn't come from money or fame. My happiness comes from seeing life without struggle. If any other part of your body has some weakness, you go, 'Well I can probably manage.' But when you're a quarterback, and it's your right hand, you're certainly concerned far as being able to do your job.